AAA finishes up Juarez. I think this might be the last appearance of Johnny Mundo for (at least) two months. That’s a long time! It’ll be OK.
Claro has all the Relevos Increibles you could want plus a Dragon Lee/Titan singles match. Esfinge/Puma turns up on Guadalajara this week. I have no idea what’s going to go on with The Crash shows and Konnan’s Patreon going forward, but maybe you know by the time this was posted. Búfalo Ayala, Fantastik, Viento vs Alastor, Mirage, Súper Caló Jr. These are mostly Tijuana people (with the exception of Super Calo), and people who are new to me. As best I can tell, they’re not introduced in order of team and many of them are wearing similar colors, so it’s hard to identify them. This is the order they come out. Fantastik is mostly in black, with white and red on the side of his pants. Viento is in white and black. Review: Último Maldito versus Keyra was the best fight of the mixed tag, and even then they had parts the crowd wasn’t all that interested in. Chik Tormenta didn’t do many big spots here, and that seems to be what they’re looking for. Jonathan did a little better, but his timing seemed off in the comeback. Review: A big move fight all the way thru. There was obvious more comfort in the Flamita/Draztick and Black Boy/Arkangel exchanges than the cross ones. Arkangel still looked awesome in moments, but there were others where they just didn’t have the best timing. That just feels like a thing of not working together much. Draztick didn’t look that far behind Flamita, though Flamita’s shove of Draztick Boy to set up the Flama Fly on Black Boy was my favorite moment of the match. It broke the rhythm of just two guys fighting in while two guys sit out and felt more like I’d wish these four ways would work. This match comes thru alright on the handheld but obviously would be a better deal professionally shot. What Happened: Black Taurus walks out in a Yellow Rebelion shirt and mask, which is the first time I think anyone knew he was meant to be in the group. Review: [good] This one got better as it went along. The early rudo beatdown wasn’t all that interesting and felt like it went for a while, but the brawl as the técnicos. Ninja and Rey Escorpión are great again each other, and Ninja seems more alive in this match than many of his others, they were the best matchup. Taurus took up most of the screen on his flying moves, which is always cool. don’t mess up the buns! Daga, Jack Evans, Oráculo vs Bestia 666, Black Danger, Garza Jr.
What Happened: Garza offers Black Danger a chance to join the Rebelion tonight. Review: [ok] The rudo beatdown in the semimain goes on way too long. It’s over ten minutes long with the right going one way, but at no point does it seem like anything’s going to come of it. This also becomes the second match in a row where someone takes a piledriver, is put on a piledriver, and then gets beaten up on it, which a spot that’s already done way too often to be taken seriously. (That match too had a long rudo stretch to start the match that didn’t mean anything.) The crowd does cheer loud at the técnico comeback, but probably just as loud as if it had been six minutes of rudo destruction, or if the técnicos had broken up the unending rudo stretch with a half minute of comeback before being cut off. Those last few minutes redeemed it a bit, but this felt like a chore to watch. Extreme matches usually don’t do a lot for me and this one just seemed like it not a lot until all the interference near the end. Starting with light tubes, doing table spots, doing ladder spots, and then going to just doing moves was an odd progression. It made more sense when they revealed the table Escorpión was making on the outside, but it didn’t feel like they were progressing to bigger spots. They were just doing more stuff until it was time to finish up. Light tube to campana doesn’t work. Mascara winning primarily due to the help of his friends is fine, but the false finishes seemed too much. 5) Mr. Niebla, Pierroth, Shocker DQ Carístico, Marco Corleone, Soberano Jr.
Guadalajara Tuesday results on a Thursday, with text and everything! It’s not enough to get over my soul being crushed by Puma losing but it’s something. Caristico & Niebla are matched up again on 12/12, so that might be an actual feud. Konnan addressed his departure from The Crash on his Keepin It 100 podcast, in a segment that starts 34:35 in. He explains it as a mutual parting of ways, rather than the implied firing The Crash statement put out. Konnan brings up two reasons: lack of trust & lack of time. His overarching belief is it’s better for everyone to be working together and getting along, because it gives everyone more places to work. He took that concept and a suggestion by Impact’s Ed Nordholm into having a meeting with AAA & Dorian Roldan. (Konnan says he was angry with Dorian Roldan two years ago, but could move past it if it was best for everyone. Also, other information suggests this meeting happened a while ago.) The idea framed here is it was about to get AAA & Crash to agree to a “non-aggression pact” – get something done to get AAA to stop running shows against them (like in Aguascalientes & Queretaro, and even them both running Nuevo Laredo the same day), and work out something so AAA/LLFMV would stop threatening Fenix & Penta & everyone they work with lawsuits. It didn’t work; AAA isn’t backing off, and The Crash lost trust in Konnan, believing he was actually trying to get back in good with AAA. Konnan noted that once you lose trust, it’s tough to rebuild it. The other issue was time. Konnan wasn’t around enough for their liking. The Crash wasn’t happy Konnan was at Impact tapings when The Crash had their big tour, and wasn’t happy that Arolucha would be another thing taking his focus away from The Crash. Konnan says they pushed him to concentrate on The Crash, he wanted to do more than that, and they agreed to split. Konnan says there’s not going to be an exodus from The Crash like has happened with him before; Crash hasn’t signed anyone to contracts, so they’re free to work from both Arolucha and The Crash if they want. Early on, Konnan mentions Mario & Nacho as the owners of The Crash, and says he was given 1/3rd of the company when he was brought on board. It’s not mentioned again. In his column today, Leo Riano says Konnan still has that chunk of The Crash. The WON mentions they’re still in the process of figuring out the business end of the split, so it’s probably in Konnan’s interest to stay on decent terms with The Crash until he gets that payoff. The Wrestling Observer Newsletter has some other differences in their version of events. Dave quotes “one person close to the situation” saying the issue was not the time issue, but “the person paying the bills gets the final call” and Konnan was making the calls himself some times. The conversation with AAA/Dorian comes up here: Konnan never got their OK to do that, and never told them he had after the fact. They found out thru others, confronted Konnan, and Konnan credited Impact with coming up with the idea. (Again, this must’ve happened a while ago, because Impact’s big idea is credited to Jeff Jarrett, and was a The Crash invasion at TripleMania. Konnan seems to have rejected the idea because too many Crash guys were still not happy with AAA.) Konnan believed he smoothed the situation out after the Crash owners found out about his talk with AAA, but instead they were quietly planning to move him out. The WON quotes Konnan saying that The Crash ownership knew about Arolucha, at one point talking to Aroluxe about getting partial ownership in the company and running the tapings in Mexico, then backing away once Arolucha decided to tape in Nashville instead. My understanding is The Crash thought their involved with Arolucha was done at that point, and were caught off guard to find out Konnan working for them and many of their wrestlers being involved. SuperLuchas solves yesterday’s minor mystery: Mephisto was the name from Leyenda de Azul field we were missing. I am not excited to get more Mephisto in a cibernetico, but the concept this year is only heavyweight (or as close as they can come) rudos in the match. There was a segment with Sam Adonis, Okumura, and Johnny Idol, pushing their new trio as a big deal. While they’re not getting the the trios title shot at against the Sky Team this Tuesday, that’s obviously coming soon – and almost has to be on the 19th. Why? Because there won’t be any Tuesday shows for a while after that according to Ovaciones. 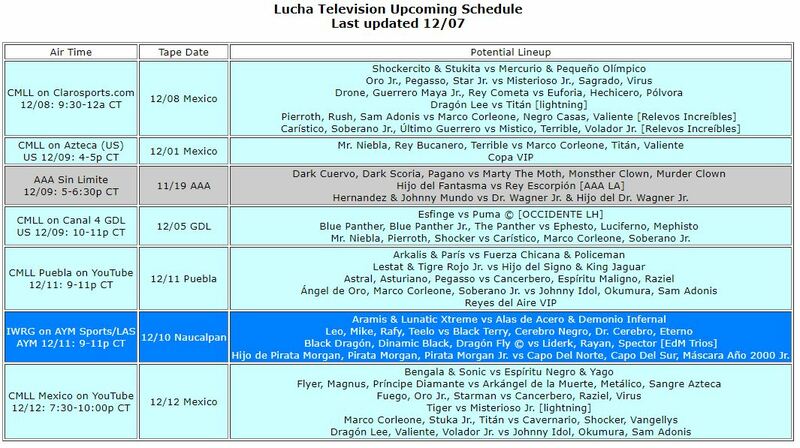 The Sunday shows on 12/24 and 12/31 are being pushed back a day to run them on the holidays and, rather than run Arena Mexico back to back days, CMLL’s taking Tuesdays 12/26 and 01/02 off. It’ll be a strange Monday/Friday Arena Mexico schedule for those two weeks. They’ll resume running Sundays on 01/07 (which will be the Three Kings Day show, so pencil in the minis feud or some title match for that date), and Tuesdays will go back to normal on 01/09. There’s no mention yet of where this leaves the Puebla or Guadalajara shows. At his press conference, Alberto said the funds from his charity show and merchandise was going to go towards 56 children who lost parents in the September earthquake. There’s a Claro article which says they’ll be streaming the event; the idea that the show would be streamed is not mentioned elsewhere. In that article, he thanks Dorian Roldan for the invitation to his event (their show Saturday?) and allowing them to use Wagner. It also reads like he thanks Roldan for allowing him to use Caristico, which would make no sense so I think something must got lost here. 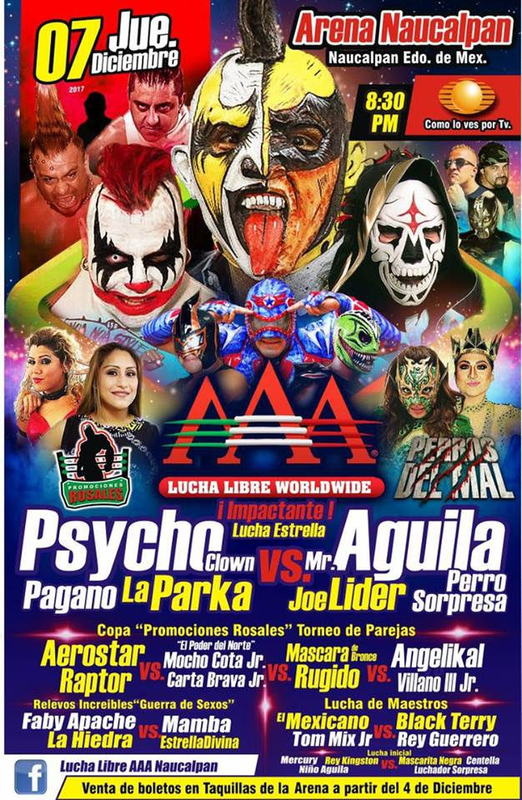 (If someone thought Caristico was still working for AAA, it would explain why he showed up on that poster as Myzteziz.) Alberto says no one’s going to have a problem working that show. That seems like fantasy talk coming from most people and Alberto’s told some whoppers, but I think the story is he’s still on good terms with CMLL ownership. They’re not going to pay what it costs to use him, but it’s possible they’d stay out of Caristico’s way if he wanted to work this show. It’s more strange Caristico would want to. At least check, he hasn’t mentioned this show on Twitter. Alberto says he hopes to fill Deportivo Morelos with 3,000 people for this show. In that article, he also says he plans on running this shows twice a year, with 5,000 people at the next one, and then maybe they can run Toluca’s stadium in 2019 with his hair versus Rey Mysterio Jr.’s mask. Fuego explains the story of how he got his original Flash name: the promoter already had a Spider-Man and a Batman and needed a trios partner. It sounds like owners of the comic book trademark got involved when he was using it CMLL, which was our guess at the time, and that prompted his change to Fuego. XFL MMA is running Arena Mexico on Saturday. CaraLucha is teasing a return show announcement next week. Ricky Marvin’s matches in Lucha Memes prior to AAA was really good, looking like one of the best guys in Mexico as he faced a variety of young wrestlers. I have no idea if he’ll recapture that, but it’s worth a shot. AAA’s got a 12/17 spot show in Orizaba with Hernandez & Rey Escorpion vs Hijo de Dr. Wagner & Vampiro as the main event. Lady Flammer unmasked Nahomi in Monterrey. Last Word in Pro Wrestling has an interview with Sam Adonis about his time in CMLL. SuperLuchas has an obit for Manuel Juarez. Simbolo talks about being a wrestling and TV star. Segunda Caida writes about Black Terry in Japan. Eterno talks about suffering a leg injury on AAA show. 6) Hijo de Pirata Morgan, Pirata Morgan, Pirata Morgan Jr. vs Capo Del Norte, Capo Del Sur, Máscara Año 2000 Jr.
oh good the Capos are back. This might be the best chance ever for the Comando Elite to win trios titles, getting a big win before the mask match the week following. No IWRG show yesterday because there’s the AAA/Rosales show tonight. It now occurs to me that someone else is probably running on 12/25 since Memes is in Coacalco. Mr. Cacao has two dives, tough rough landings. Vangellys is still wearing his anti-Ingobernable shirt. Virus & Cacao talk on the microphone to tease a rematch in Japan. You can skip the main event without missing anything. It was a match just to set up the double dive in to the ring by Marco and Diamante, and everyone was taking it pretty easy to that point. I was really surprised when Stuka did the blind tope onto Niebla at the end because it really didn’t seem worth that sort of risk the rest of the way. The crowd reacted strong to the finish but I didn’t get much out of watching it. The semimain might have turned out well, if not for Luciferno losing his mind and fouling Soberano for no particular reason. It was built to in that the técnicos had their comeback way too soon for something to be up, but not really in any other grievance between the two. Ephesto and Blue Panther were good on the mat and Soberano flew out of the ring nicely, but that’s about it. Mr. Cacao almost killed himself on both his dives and he and Virus totally screwed up whatever that spot was supposed to be before the cutter. It wasn’t all that bad, but it wasn’t something to build to a rematch challenge afterwards for sure. Coming into face Virus in a special one off match and deciding to give up doing the mat wrestling after three minutes seems like you’re missing the point of the whole thing, but maybe that’s all Cacao can do. He actually is in amazing shape for his 50s at least. Virus kicking out of a cradle and turning into the winning submission would’ve been the greatest Virus finish ever. Unfortunately, it had to go one and got worse. The third tag match felt too same-ish to really pop up as something worth watching, but there were a few good moments. Rey Cometa continues to look good at small things (selling his hand after chopping Polvora) and big (crashing and burning on a tope). Dragon Rojo’s Dragon Bomb on Titan looked as good as it ever has. They can still do better than this. The women’s match felt like an atypical encounter. The rudas were unusually aggressive, the tecnicas fought back at that level, and the match kept moving. Not only did we get a dive, but Zeuxis broke out her big match moonsault, so they did want this to be something for whatever reason. I’m happy Metalica got a t-shirt because it’s better than her gear, and I don’t think I’ve felt that way about t-shirt wearing wrestlers before. Her sell of Jarochita’s forearm late was much better than the actual forearm. Jarochita’s kicks can look weak and misaimed at times, and she does a lot of them. The match still worked in spite of them. The opener was nothing earthshaking, but interesting matches with the new guys worked well still stand out. It moved at a really good pace with some cool spots. I actually thought Fiero looked the shakiest of the four guys; his finish was eye catching, but he seemed a bit off on some of his earlier big moves. Magia Blanca put on a much cleaner performance, and either got better or got more confident in the last few months. Yago easily outshined Grako.